I went to the Oregon Coast this weekend and never saw the ocean - but had a spectacular time! 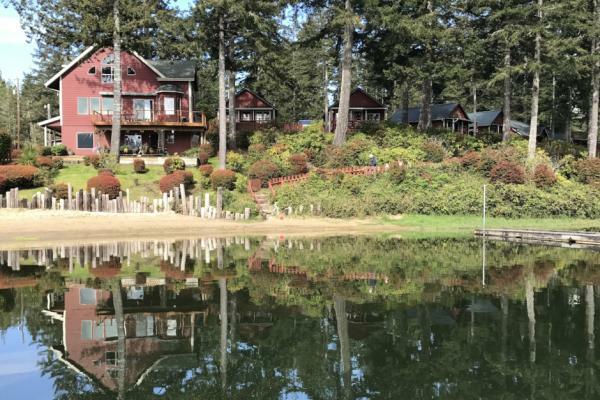 It is not always known that the Oregon Coast offers natural attractions beyond the beach, dunes and waves... there are also dozens of fresh water lakes and coastal estuaries. These sparkling gems are tucked in between sand dunes and pine-filled forests and are ideal for fishing, boating and kayaking. My family (mother, father, sister, brother-in-law, niece, nephew and my daughter) headed out to Mercer Lake Resort. A collection of rustic red cabins are clustered around a tiny marina. There is a single gas pump, a boat launch and yes, they sell bait and ice cream in the office. Here you can step back in time as the wooden sign above the front door proclaims. It wasn&apos;t until just a few years ago that they put television sets in the cabins. And mobile service is still iffy. A perfect getaway to just be with family. It&apos;s the shoulder season so we were able to book two adjacent cabins for our crew. Generations of the families have been coming here for years, and as one guest said to us "The only way to get a prime summer spot is by death or divorce." When he turned 18 years old he put his name on the wait list and ten years later he got his preferred week. My family has been coming here for twenty-five years on a space available basis - and we love it. We rolled in an hour before sunset Friday night. Our two bedroom cabins also had beds in the main room providing plenty of sleeping options. There was a full kitchen with the basic necessities. Overall, small, simple, but very clean and comfortable. The bathroom and shower was housed in a communal building. (Other cabins have their own bathrooms.) 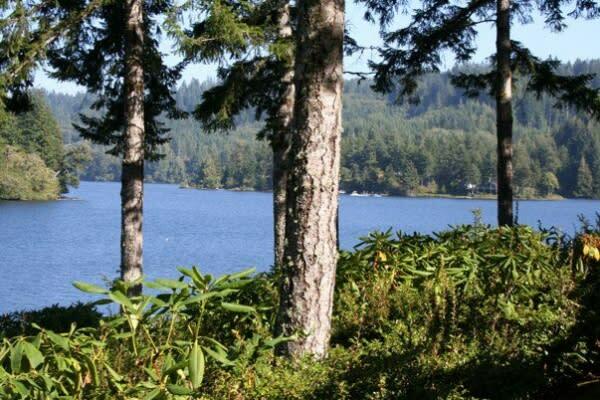 The best feature of our cabins were the large front porches overlooking the lake. Here we threw together a simple dinner and toasted our arrival as the sun set, then put ourselves and the children to bed. 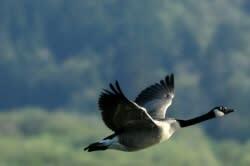 I slept well, waking only to the raucous honking of geese in the morning. It was just 6 a.m. and I rose to look out at the lake. Flushed in soft pinks and yellows, the water was glassy, broken only by the geese alighting and skimming across the surface. It was chilly and a soft mist was drifting across the surface. Wrapping myself up warmly, I took a book and cup of coffee to the porch picnic table and settled in to watch the lake wake up. I saw my brother-in-law take his one-man outrigger canoe out onto the water and glide away. My father passed me with his tackle box and fishing pole. "I&apos;m going down for my fishing meditation," he said. He walked down to the docks and took a seat on one of the wooden benches. The rest of the family, and other resort occupants, slept on. I watched a pair of geese dance in unison across the water, honking back and forth to each other, and looking like graceful swans. A gaggle of geese strutted around the small sand beach with little goslings hurrying between them. Another procession of geese swam across the marina in a perfect line and then the two groups greeted each other with a rowdy flap of wings and loud cries. When they quieted down again, I could hear the softer trill of song birds and the buzz of bees and insects. Pollen drifted thick through the air and landed on the surface of the lake. There was so much life in every inch of the outdoors. The sun slowly rose from behind a ridge of tall trees, dousing the scene in warm yellow light and the wind picked up. I went in and made breakfast. 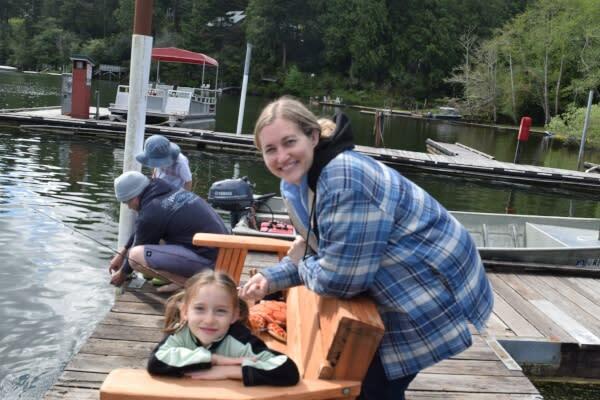 As a family we started off fishing. 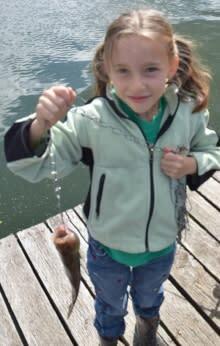 My daughter was thrilled to be the first to catch a "large" perch with her new fishing rod. 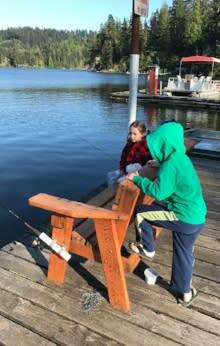 It was quickly followed by trout and more perch (all smaller) as the others cast their lines. It is amazing how such a simple activity can generate so much joy. Next we rented the Mercer Lake Resort pontoon boat, sitting on deck chairs under a canopy roof. We brought along beer and fishing tackle with high hopes to find a perfect little cove. But the wind had picked up and the boating was rough and cold. We quickly discovered that the wind turned the canopy into a sail and we couldn&apos;t hold our anchored fishing spots. So it became a "tour" of the lake instead, recounting previous summer&apos;s fish tales and pointing out lake houses belonging to people we knew or lake houses we&apos;d always wanted to own. A lazy cruise of dreaming and storytelling. When the kids were cold enough, we returned to the resort. Splatters of rain came down, clouds skirted about the sky, then retreated, but the wind persisted. So we gathered in one of the cabins for lunch. I made a white bean chili and we played double solitaire, which in our family can get pretty competitive. We also had quiet time, with each of us on our separate wanders or relaxing in a book-reading nook. The grandparents had come out early and shopped at a toy store in Historic Old Town Florence, so the kids had fun with balloon-powered race cars, bubbles and yo-yos. That evening we joined around one of the kitchen tables for a collaborative meal that included our freshly caught fish, lomi lomi salmon, macaroni salad and homemade rhubarb pie. Tucked in that night, we could just hear the sound of the ocean waves although they were out of sight. Abundant sunshine greeted us and we headed down to the small sandy beach and docks for more fishing. This time there was no wind and the children were soon in their swimsuits and digging their own private lake in the middle of the beach. 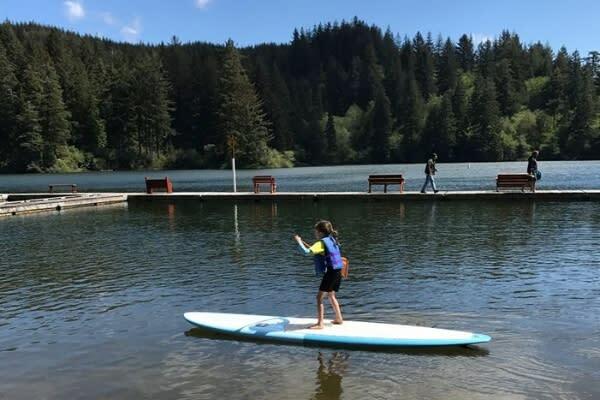 We took turns paddling the one-man canoe and the stand up paddle board, the children staying inside the shallow dock area and the adults cruising around the lake. My sister discovered a lily-pad encroached cove with a narrow water trail and later, in the one-man, I paddled it too feeling like an explorer in the Disney Jungle Boat ride. The reeds gradually took over the water trail and I had to turn around and come back to reality. The morning had flown by and we dragged our feet leaving the resort. My daughter lamented that she wanted to stay a week. I agreed, two nights was not enough. 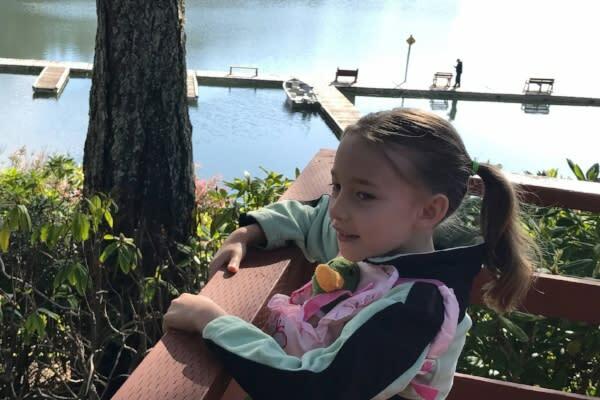 After packing up, we caravanned to Historic Old Town Florence and dined at the recently opened Siuslaw Riverside restaurant. 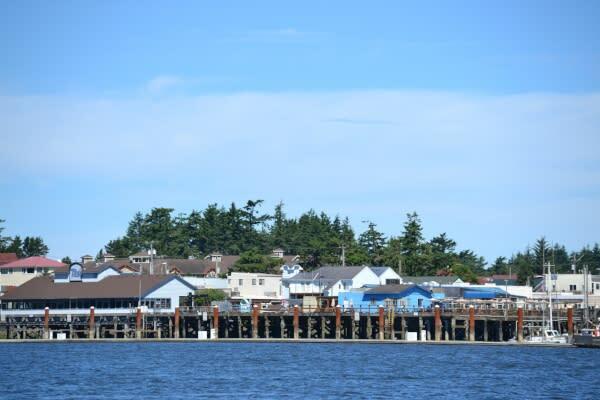 Right on the edge of the Siuslaw River, we enjoyed delicious fish and chips and gyro sandwiches. The staff was friendly and told us stories about an otter family that had taken up residence just outside on the docks. We watched for them from the tiny balcony, but only saw seagulls diving and swooping. Historic Old Town Florence is a delightful spot, and worthy of several days itself, or at least a full afternoon. But we didn&apos;t have the time today, so after lunch we ducked into only a handful of stores as we walked back to our cars. The storefronts along Bay Street are jam-packed with unusual trinkets, art and gifts. I reminded myself that I needed to do my holiday shopping here next year! Sandy, wind-burnt and completely happy, we headed home. Never did see the ocean on this Oregon Coast this trip - but sure had a wonderful, memorable, lets-do-it-again kinda time!